Born Caius Julius Verus Maximinus. He was a Thracian of great size and strength with numerous stories existing regarding his strength and stature. Claims of seven or even eight feet tall abound and that he wore his wife's bracelet as a ring. Because of his Thracian a ncestry, he was also known as Maximinus Thrax. Under Severus Alexander he was given the governorship of Mesopotamia. 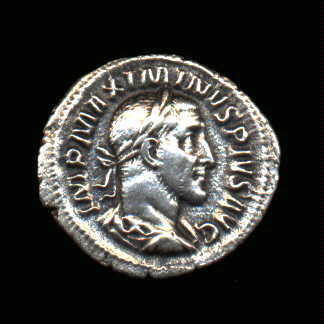 On 22 March 235 AD while in the Rhine he was saluted emperor by the army. 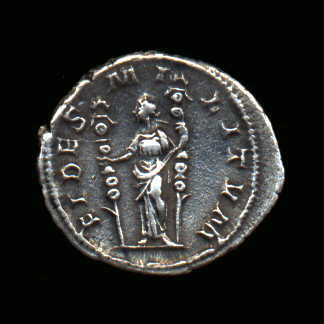 In March 238 AD, forces loyal to Maximinus defeated the Gordians in Africa a nd later the same year he waged war against their successors, Balbinus and Pupienus. When Maximinus failed to take Aquileia, his army rebelled and murdered both him and his son, Maximus, on 24 June 238 AD.